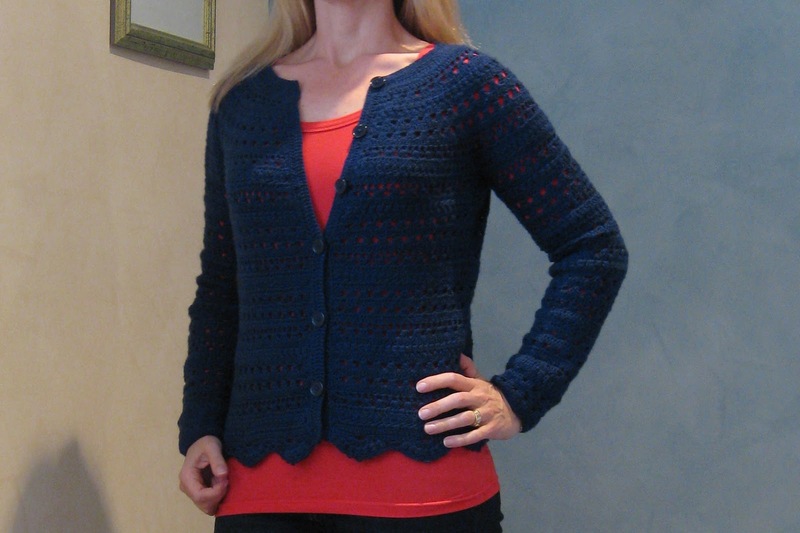 This is a top down (my favourite kind of crochet) cardigan, a free pattern by Drops Designs. I haven’t crocheted much since the Lily Chin Lace Dress but during Me-Made-May I got totally inspired by a couple of crochet cardi’s made by Catherine from the Makings of an Urban Rustic and got the urge to hook something again. I used an Australian wool as we are coming into winter and I was cold this week: 4 ply Bendigo Woollen Mills Luxury Wool in Navy Blue. It is a very easy project, with clear instructions and schematics. They have a rather annoying moment where they say “increase 32 dc evenly (over 111 stitches)” which really bugs me: just tell me to increase every x stitches for a total of y number of increases!!”. I find the easiest way to work this out without having to get out the calculator and spend ages counting is to get out a few stitch markers, divide the row evenly into an amount that goes equally into the number of increases, and break down the increases into x number of increases per section. I divided mine into 8 sections and then increased by 4 each section, which I did just by eyeballing it. They tell you to “increase x dc evenly” several times in the pattern. I find its an annoying shortcut by the pattern writer that makes my job much harder than it needs to be. Just a pet peeve there. If anyone has a great way of working it out please tell me!! The top down construction meant I could try on as I went, which I find is ESSENTIAL when I am using a totally different yarn than the pattern states and guage is hard to match. I had to drop down from the recommended 3mm hook to a 2.5mm hook to get close to the guage in the width, but I still am longer/taller in the row height. This is a common problem I have, I seem to do tall DC/Treble stitches. Trying on at the point when the yoke is joined under the arms meant instead of stopping at the recommended 13 cm I completed additional rows to 15 cm, otherwise the armhole would have been a bit too snug under armpit – this pattern does have very tight sleeves and a snug armscye so this is something to be aware of. I didn’t do the increases to the body as it already was big enough and the increases would have made it swim on me. I also didn’t make it as long as the pattern, stopping at 11.5” (29cm) to add the bottom trim rather than going to I think 38 cm. I did 5 full pattern repeats to make the sleeves full length for winter. The last few rows I did in the round rather than rows. Overall I am extremely pleased with this pattern. 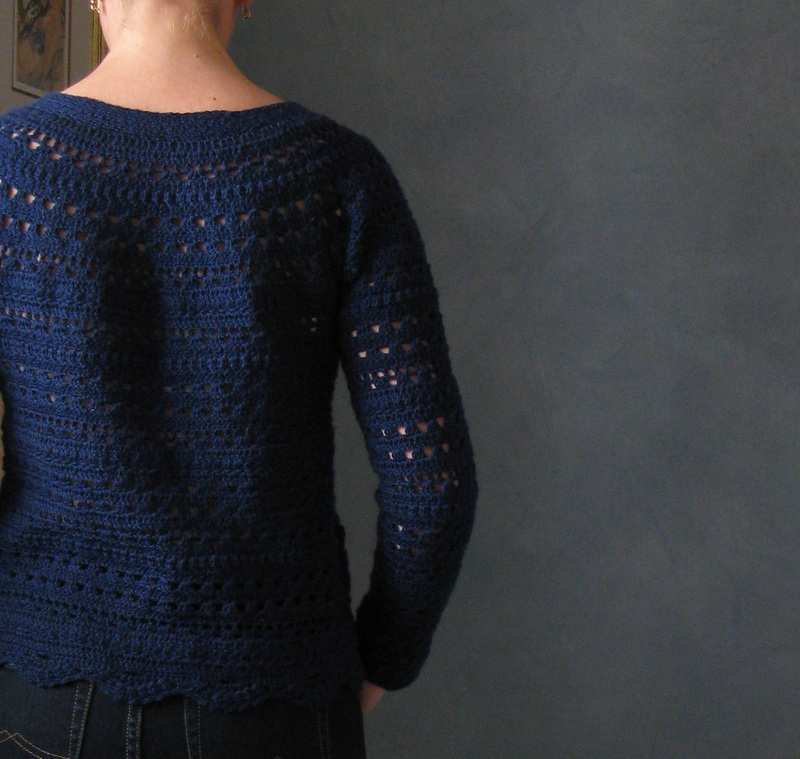 The edging for the front and the neckband produce a really nice neat result. The neckline shaping in particular pulls up the rather open almost boatneck look into a really nicely sitting neckline. 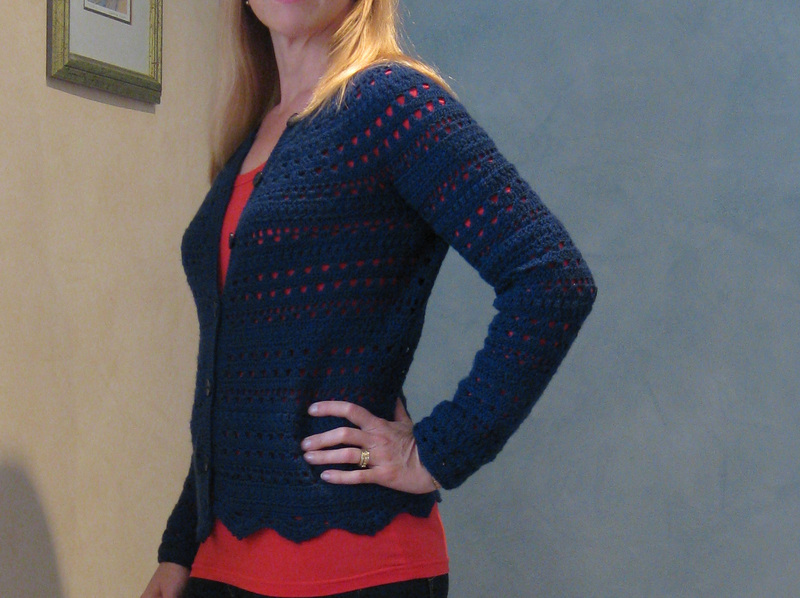 I plan to follow this pattern again but next time I will change the decorative rows into something different to produce a very different looking cardigan. For my shape, I also think it could benefit from some shaping decreases starting one or two rows under the arms into the waist and then increasing out for the hips to give this a more fitted look, as I think it is a bit too boxy in the midsection for my liking. 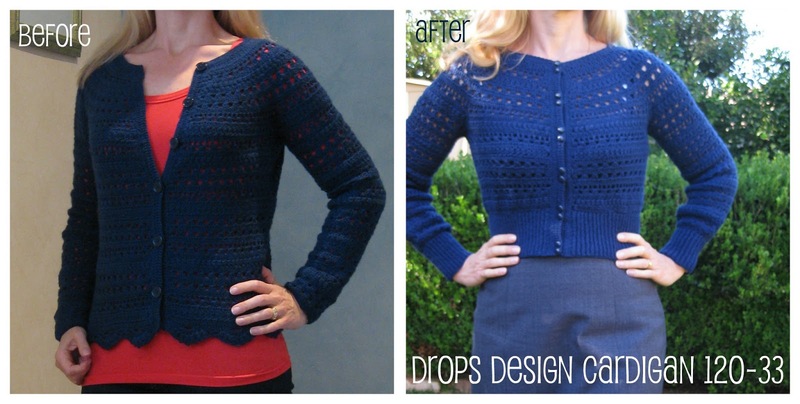 As a I have this cardigan as a prototype I can easily work out what decreases/increases to make by pinning out the excess fabric in standard “dart” positions front and back and then decreasing/increasing accordingly to give subtle shaping. The sleeves are very fitted but the body is much looser than I expected, especially as my finished width at bust point is bang on guage. Looking at other projects for this pattern on Ravelry they seem to be more fitted so either my guage is still too big despite going down to a 2.5mm hook or I should have made the smaller size.